The Care Packages from Stay at Home Snacks are a variety of 50 individually wrapped single serve snacks. This snack box includes a Healthy mix of delicious snacks that everyone will enjoy. This assortment of name brand snacks will impress any recipient! Stay at Home Snacks will do all the work for you! Save a trip to several stores and that costly shipping expense at the post office. Fantastic Gift! Perfect for college care packages, military care packages, camp care packages, back to school care packages, road trips and more! Great gift for holidays, birthdays and housewarming gifts! Ships Fast! Send directly to your recipient using Amazon! A gift message or gift wrap can even be included at checkout. 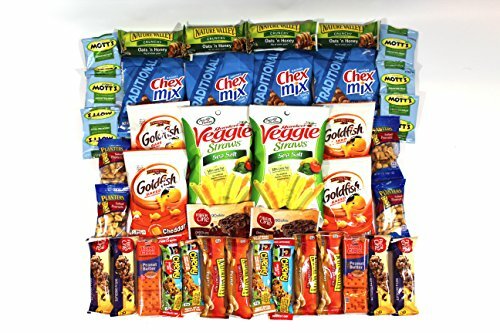 Included: 2- Fiber One Chocolate Bars, 4-Planters Peanuts, 4- Goldfish, 2-Veggie Straws Assorted Flavors, 4 Chex Mix, 4-Nature Valley Crunchy Bars, 2-Lance Peanut Butter Cheese Crackers, 6-Motts Fruit Snacks, 4-Nature Valley Peanut Bars, 4-Quaker Oaks Chewy Bars, 4-Fiber One Bars. This comes packaged in a Stay at Home Snacks box. Ships Fast! Send directly to your recipient using Amazon! A gift message or gift wrap can even be included at checkout. Item is packaged in a Stay at Home Snacks tm box.